Theatre Arts Guild is proud to present the fourth biennial Playwrights @ TAG Festival. Mrs. Walford by Brenda Tyedmers. In June 1887, a young Brooklyn wife flees her troubled marriage and takes refuge at the Queen Hotel in Halifax. But her plans for a drastic next step are thwarted by an unexpected ally. Mrs. Walford has been on Brenda's mind since 2003, when she found a "Queen Hotel, Halifax N.S." plate fragment in her backyard. She did a Google search that turned up two lonely results; one of these was a Brooklyn Daily Eagle account of a tragedy involving Mrs. Robert M. G. Walford in 1887. Informed by actual Halifax and New York newspaper reports and other historical research, this play is a work of fiction that explores "Who was Mrs. Walford? ", "Why did she do it?" and "What might her future have held?" if someone had noticed, and cared, and acted. Some Guy from the Internet by J.L. Allen. Hilarity ensues when an aging mother unwittingly discovers the world of online dating. She invites her children for dinner to meet her suitor for the first time, only it turns out that this strange stranger may not be exactly who he claims to be. Full of plot twists and clever comedy, this is one act you don't want to miss! Lexy from Skye Meets Davy by Ralph A Walton-Bone Urquhart. Is life random? Is it pre-determined? Is it all imagined? 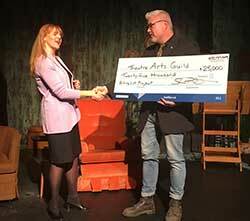 March 14, 2019 - District 9 Councillor, Shawn Cleary, presents TAG President Rayna Smith-Camp with a $25,000 donation to help with our parking lot project. Thank You!! TAG Memberships - Join Online! A TAG membership is the ideal way to help your community theatre thrive while developing your own theatrical skills, interests, and making new friends. Join online today!